"Trust me. This is the only baby book you'll ever need! It's amazing, heartwarming, and completely user-friendly. Just add your heart!" Barbara Nicholson, MEd, CEIM, received a master's degree in education from Stephen F. Austin State University and a bachelor's in education from North Texas State University, with Learning Disabilities certification from Texas Woman's University. Professionally she taught children with learning disabilities and has been a La Leche League International support group facilitator for over twenty-five years, educating and helping mothers with breastfeeding. In 1994, Barbara cofounded Attachment Parenting International (API), a nonprofit parent education organization, where she served as president of the board of directors for fifteen years. As API cofounder, she has given talks and conducted parenting workshops all over the country and internationally on attachment parenting issues. She is the mother of four grown sons and lives with her husband in Nashville, Tennessee. Lysa Parker, MS, CFLE, CEIM, received her bachelor's in education and her master's degree in human development and family studies from the University of Alabama. She earned her designation of Certified Family Life Educator (CFLE) from the National Council on Family Relations in 2004. As cofounder of Attachment Parenting International (API), she has served as the executive director for thirteen years, focusing on program development, public relations, and fundraising. Prior to her involvement with API, she worked as a special education teacher helping children with multiple handicaps and learning difficulties. Most recently, she was named president-elect of the Southeast Conference on Family Relations for 2013, an affiliate of the National Council on Family Relations. Lysa is the mother of two grown sons and a stepdaughter, and she is the grandmother of three. Currently Lysa is a writer, speaker, and parenting consultant in private practice at www.parentslifeline.com. "Attached at the Heart remains the most thorough and educational perspective and resource for parents interested in the principles and long-term benefits of Attachment Parenting. 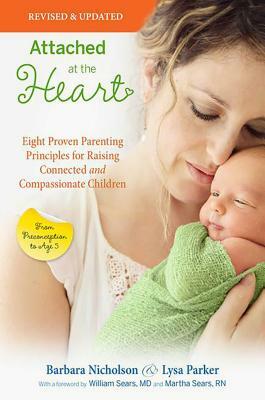 From decisions about birth to gentle discipline to staying connected throughout your children's life, this is the book every parent interested in any aspect of Attachment Parenting should have on hand. "—Mayim Bialik, PhD, Actress, "The Big Bang Theory", "Blossom"